Diamond Care & Cleaning – Easier Than You Think! After an evening of black cocktail gowns, champagne and attracting envious stares, when you are putting that diamond tiara away in your safe, make sure they aren’t kept next to other jewelry pieces since this can cause scratches. A velvet- or satin-lined jewelry case with separate compartments is recommended, separate jewelry boxes will work perfectly as well. If you love your diamonds take the time to individually wrap each piece in soft tissue paper or use jewelry pouches for each piece. Never wear your diamonds to bed. Take off that ring because while you’re asleep, and a prong in the mounting gets caught in the bed linen, the 1mm claw is subjected to the pressure of your body weight if you turn over. Bedtime pastimes of more intimate nature are best done with the stones off. Similarly, remove diamond jewelry before you take a shower; soap will deposit a film on the stones which has a dulling effect. Neither should you wash your ring in the sink—there is the risk of it going down the drain. Instead, put it down in a secure place (for those who insist on holding it between your teeth, do this gently). 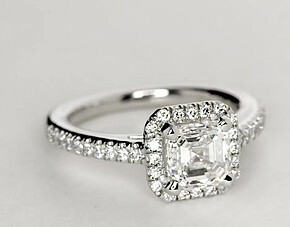 Here’s a simple way to ensure the stones are safe: every week, look sideways at the prongs of the ring as you rotate it. They all should have contact with the diamond. You can also inspect the center diamond in your engagement ring by tapping it gently with a tweezer, if any movement is detected remove it immediately. Remove fluff caught in the prongs gently. Always wear diamonds after you have put on your creams, skin oils, perfumes and hairspray. Lotions, powders and soaps, apart from the natural oils from your skin, will create a film on diamonds, which will reduce their brilliance. Plus, chemicals in the air will oxidize or discolor the settings. Keeping your jewelry clean will maximize its brilliance. Along with these, household chemicals can also cause deposits that will dull your diamond’s brilliance and sparkle. When you discover that your diamond jewelry is not sparkling enough, soak or boil them in a solution of water mixed with a few drop of ammonia. Or do some gentle scrubbing with an old, soft-bristled toothbrush for more extensive cleaning. Then rinse the piece and dry it with a clean soft cloth. It is important for the genuine diamond-lover to keep diamonds looking their very best. Touch the center diamonds in your pieces as little as possible because the oil in your skin will be transferred from the fingers and change the luster of the stones. 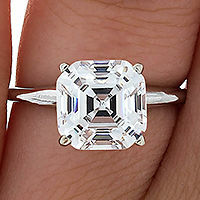 The most effective method of keeping your diamond engagement ring sparkling clean may sound odd at first. Just place your ring, or other diamond jewelry in a boiling pot of water, adding 5 to 10% ammonia for five to ten minutes. Always let the water cool before removing the ring. Then place the ring in a cup of cool water for another ten to twenty minutes. This allows any remaining ammonia to diffuse off the ring eliminating the possibility of a film. Just wipe the base of your ring dry with a napkin, or paper towel and once again enjoy its beauty! An alternative, although less effective method is to just drop your ring in an ammonia jewelry cleaning solution overnight. In the morning, take the ring from the solution and use a soft, clean toothbrush to brush it in order to remove leftover dirt accumulated over the week. One should be careful while scrubbing the fragile settings of the stones with a toothbrush; diamonds always love the soft touch. Afterwards, wash the stones with water (or let them sit in a cup of cool water for 20 minutes) and wipe with a soft, lint-free cloth.